Nanci joined Cushman & Wakefield | CRESCO Real Estate as a Senior Vice President in 2013, specializing in advisory services, focusing on the acquisition, restructure, and disposition of commercial properties including corporate representation and strategic real estate planning. 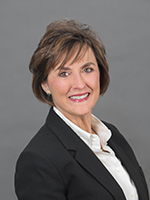 Nanci has extensive corporate real estate experience where she was charged with leasing space nationwide. Nanci was Vice President at Kowit & Passov Real Estate Group from 2008-2013, Grubb and Ellis from 2003- 2007, and Trammell Crow from 1998-2002. She was Senior Asset Manager at Key Bank from 1992-1997 and Director of Information Services at Ostendorf-Morris Company from 1983-1992. Nanci recently received the Crain’s Notable Women in Real Estate award in September of 2018, for her outstanding achievements in the real estate industry. ALEXIS PARK 3380 Brecksville Rd. WASHINGTON SQUARE 28080 Chardon Rd. MARYMOUNT OFFICE BUILDING 12000 McCracken Rd.